Official Google Blog: Get lost! Ever get lost, or turned around? Found yourself in unfamiliar territory? Or worse, awakened with just one shoe on? Well, we have something for you. 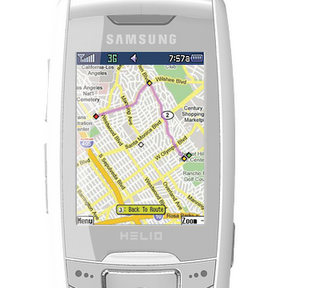 No, not a shoe -- we mean GPS-Enabled Google Maps on the Helio Drift. In a very short time, Google Maps for Mobile has taken a lead in mobile mapping and is available on more than 300 phone models. Now we've taken it to a new level: we're partnering with Helio to bring you GPS integration with Google Maps. It's hard to enter a starting point if you don't know where you're starting from. We think that integrating GPS capabilities into Google Maps for Mobile will make our phones much smarter -- and you've told us that too. When you use Google Maps on the Helio Drift you always know where you are. Start Google Maps and a blue dot is placed on the map at your current location. You can even see yourself move on the map as you change location. Say goodbye to sore thumbs from having to constantly type in your location. Of course, you still get all of the popular Google Maps functionality: real-time traffic, detailed directions, integrated search results, easily movable maps, and satellite imagery. So get yourself a Drift and just get lost! No matter where you end up, we'll show you the quickest way out.